Put new life in your KAI scissors. Re-sharpen them! $6 a pair includes return postage. I only sharpen straight scissors, no decorative edge scissors. I use the "twice as sharp" method and the results on KAI scissors and others is stunning. Due to security "issues" this offer is available in the USA only. You don't want to loose your scissors in customs. PS. 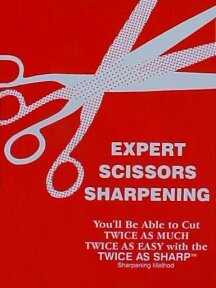 All scissors need to be mailed with $6.00 payment enclosed to: Jim Stephan, 21109 79th St. California City, CA 93505-1810. This address is on the order blank page too so feel free to just print out the page and wrap your scissors well so you don’t stab the mailcarrier, ok? The cost is a bit more for professional barber scissors. Contact me with what you have for details.